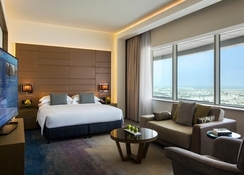 Towers Rotana Dubai is strategically located on Dubai’s posh Sheikh Zayed Road, 4km from Burj Khalifa, and offers stunning views of the seaside while being easily accessible to the city’s major attractions. Step into its majestic elegant lobby and be greeted by the multi-lingual welcoming staff at the reception. Featuring 375 rooms, suites and apartments in modern décor and featuring abstract artwork, eight meeting rooms, conference facilities, this hotel is a favourite among tourists visiting Dubai for business and pleasure. Bask in warm Middle-Eastern luxury and relish top flavours from across the world at the hotel’s restaurant. The hotel is in close proximity of the Financial Centre and the Jumeirah Beach Park. The hotel also features a currency exchange desk. The Towers Rotana Dubai hotel is located close to the Financial Centre Metro Station. It is just 4km from the tallest building in the world – the Burj Khalifa, and is 8km from the Jumeirah Beach front. World’s biggest shopping mall, The Dubai Mall is literally two minutes’ walk. The Dubai International Airport is 10km away. 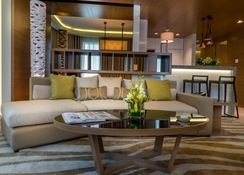 Towers Rotana Dubai has 375 rooms, suites and apartments designed in modern décor. The rooms are furnished with abstract art and premium bedding to enable a good night’s sleep for the guests. 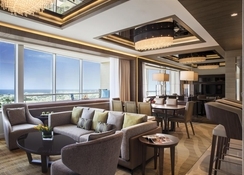 Guests can relax watching satellite TV, or enjoy the breath-taking vistas of the Jumeirah Beach or Dubai Cityscape. Towers Rotana is home to several top-notch restaurants in Dubai – serving a wide array of flavours from regions far and beyond. There is the Long’s bar, which is the longest bar of the region, the fusion fine dining restaurant Teatro, all day dining at Flavours on Two, a la carte restaurant – Gardinia and the lobby café Wraps. There is a lavish Friday brunch. The Aquarius bar serves alcoholic and non-alcoholic beverages in a leisurely ambience. 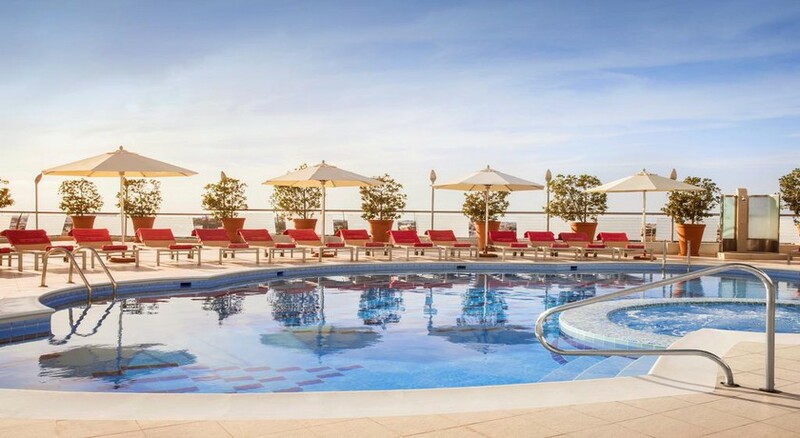 Towers Rotana Dubai has a lovely rooftop pool with sun terrace where guests may take a relaxing dip after a busy day. 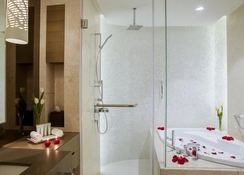 There is a well-equipped Bodylines Fitness & Wellness Club and a steam room. There are sweeping views of the coast and the beach area around Jumeriah. There are various shopping malls, dining and entertainment options in the neighbourhood.